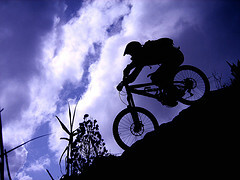 Mountain bike shocks are an important aspect for a comfortable ride. The front shock is called a fork and it connects the head tube with the front wheel. Rear shocks vary by bike and normally have a pivoting bracket or triangle. Hard tails have just a fork with no suspension in the rear. The suspension of the bike is designed to prop everything in such a way as to absorb the impact of the rough terrain and make it easier on your body. At the same time, better mountain bike shocks and a better suspension system always equal better control in the end. I still ride a hard tail which means I only have mountain bike shocks in the front. A lot of people are going to full suspension. They have come down in price and are a lot more comfortable, or so say my teammates. I will not ride one as I do not want to know what I am missing! Coil shocks use steel or titanium coil springs to absorb the shock. Coil shocks are heavier, but are more sturdy and are great for the extreme style of Freeride or Downhill Riding. They tackle the small bumps faster. Mountain bike air shocks use air to absorb the shock. Air shocks are what I have on my bike. They are more common and are good for most types of riding. They are light and adjustable. If you ride Freeride or Downhill you'll need a lot of travel in the shock. You'll have big drops and need the bike to absorb that. The travel in these bikes are usually 6 inches or more. If you ride cross country or have less strenuous drops you'll want a travel of 5 inches or fewer. You want to be able to adjust the travel, for varying terrains. Plus the less travel the faster you go. In general, Freeride bikes have front and rear shocks that offer 6 inches or more of travel, whereas cross country bikes have fewer than 5 inches of front and rear travel. Dampening adjustments adjust how much the mountain bike shock compresses and rebounds back to form. Preload is how much pressure is needed to compress the shocks. On air shocks you use a pump to pump more air in the shocks according to your weight. If you riding with a pack you add that weight as well. Preload affects how much pressure is needed to compress the shock. More air makes it more stiff. On coil shocks the spring is tightened or loosened. Many shocks have lockouts. This is important for if you'll travel on roads or ever want a rigid bike for long climbs. Good types of shocks are Rock Shox, Fox and Marzzochi. Not every mountain bike has good stock mountain bike shocks. Professional quality mountain bikes do. When competition gets tough mountain brake suspension systems and other upgrades of that nature can be the difference in a comfortable race and a painful race. When it comes to steep slopes, sandy areas, and really bumpy areas you may be surprised as to how handy mountain break suspension system can be. Obviously, you are going to pay more for a mountain bike with some good shocks and a good suspension. But in the end it can be worth it depending on your goals. If you are a recreational rider your stock shocks are fine. If you do multi-day adventure racing or mountain bike racing you are going to need a beefier pair of shocks. A lot of people are going to full-suspension bikes. These means there is suspension in the front and back. Some deem this necessary on long bike rides. The comfort is undeniable. For better control and speed however, a hard-tail is the way to go. I ride a hard-tail due to the weight of the bike. A hard-tail is much lighter, though full-suspension bikes are starting to bridge the gap. For instance my bike is a 21 pound hard-tail. In the same price range $3600, a full suspension would be about 25 pounds. It really will come down to personal preference and of course cost. Full suspension are more expensive. Do Shocks Make Bikes Last Longer? A good pair of shocks can certainly lead to a much longer lasting bike. This is because all of the impact on the trail will not be absorbed by the frame of the bike and its parts. Mountain bike shocks are one of those things that you probably don't think about. They may be able to make you a better rider and give you an overall better experience. Well at least they will give you a more comfortable experience! You can learn more about how to buy shocks and what type of bike is best for you in Todd Molloy's book How To Buy A Mountain Bike.